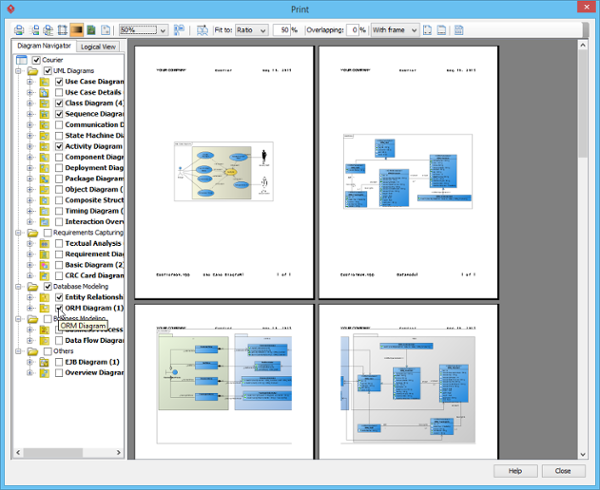 The Print window allows you to preview the printout and to execute print jobs. I also comes with a set of options for you to configure the printout. To open the Print window, select Project > Print from the application toolbar. Print Print the diagram(s). The Print window will be opened. Quick Print Print the diagram(s) without previewing them. The Quick Print window will be opened. Page Setup Set up the page properties, such as paper size and orientation. Adjust Margin Adjust the margins of the pages. Use Gradient Color Select the use gradient color in printout. Since printing gradient color will use up lots of memory, it is recommended to turn this option off for better performance. Print Diagram Background Click to print diagram’s background when printing. When un-clicked, background color is ignored in printing. Global Page Number Page number can be optionally displayed in printout. By default, the numbering of pages is diagram based, meaning that each diagram has its own set of numbers and the numbers reset for a new diagram. 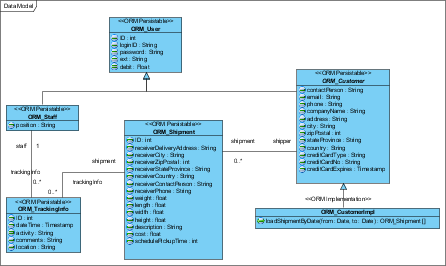 The Global Page Number option is to enable the continuous numbering of all diagrams. 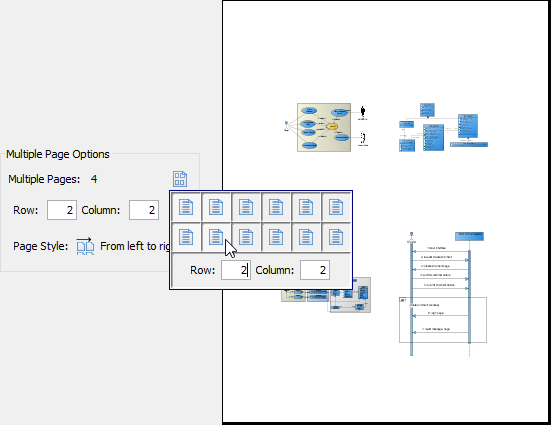 Zoom Select the percentage to reduce/enlarge the print preview of diagrams. / Paper Base Layout/ Diagram Base Layout If the Fit to Pages option is chosen, and there are multiple pages in the printout, choosing Paper Base Layout will cause the distribution of pages to be paper-oriented (the diagram size is ignored in arranging the preview); while choosing Diagram Base Layout will cause the distribution of pages to be diagram-oriented. Note that this option affects the preview only; the order of the printout remains unchanged. / Paper Place Style Change the order of the printout. A large diagram is divided into many pages, choosing From left to rightwill arrange the printout order from the pages on the left to the pages on the right, while choosing From top to bottom will arrange the print order from the pages on the top to the pages on the bottom. Fit to Ratio Set the diagram size to fit to the specified ratio. Fit to Pages Set the diagram to be printed on the specified number of pages. Overlapping Set the percentage of the margins to overlap among adjacent pages. Border Determine whether to add frame or boder around diagram in printout. Show/ Hide Clip Marks on Page Select/ deselect to show/hide the clip marks on the printout. Edit Header/ Footer Edit the header and the footer of the printout. Multiple Page Mode Switch to the Multiple Page Mode to set the multiple page options. You can use the Print command to select the printer. Set the range of pages and number of copies to be printed. 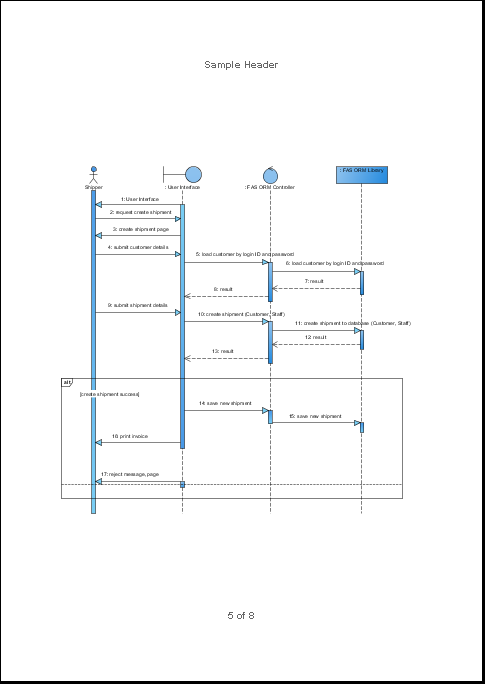 Select the desired diagram(s) for printing. The selected diagram(s) will be shown in the preview area. Click the Print button on the Print preview toolbar. The Print window will be shown. 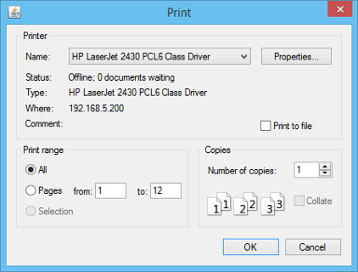 Select a specific printer, the page range and the number of copies to be printed. You may click the Properties… button to configure the printer-specific properties as well. Page Setup allows you to specify the page size, orientation, as well as the margins of the pages. Click the Page Setup button on the toolbar. The Page Setup window will appear. 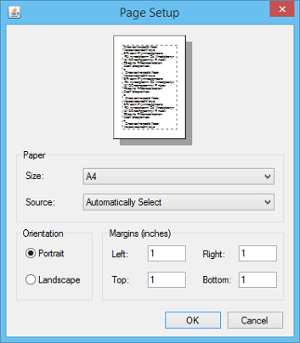 You can click the Size drop-down menu to select the paper size for printing. You can check either Portrait or Landscape udner Orientation. You can enter the value into the Left, Right, Top and Bottom text fields to adjust the size of the corresponding margin. The Margins pane allows user to specify the margins of the pages, header and footer. Click the Adjust Margin button on the toolbar. The margin setting page will be shown in the preview area. You can edit the margins size by entering the sizes into the text fields. Alternatively, click the spinner buttons to increase/ decrease the margin sizes. Click the Finish Adjust Margin button when you finish configuring the margin settings. The margin sizes will then be updated. Diagrams can be zoomed in or zoomed out according to the user’s preference. Click the Zoom drop-down menu to select the desired zoom ratio. The preview area will show the diagrams in the zoom ratio that you have selected. 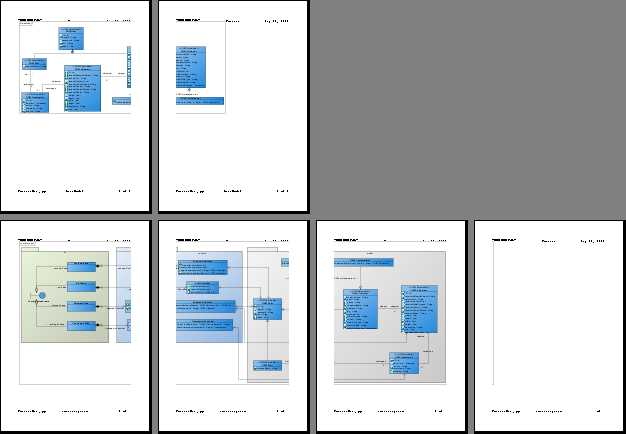 There are two layouts that you can choose for the print preview, the Paper Base Layout and the Diagram Base Layout. 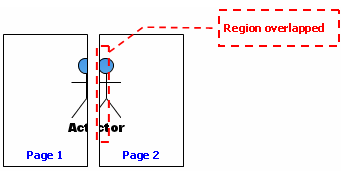 If the Fit to Pages option is chosen and there are multiple pages in the printout, choosing Paper Base Layout will cause the distribution of pages to be paper-oriented (the diagram size is ignored in arranging the preview); while choosing Diagram Base Layout will cause the distribution of pages to be diagram-oriented. Note that this option affects the preview only; the order of the printout remains unchanged. 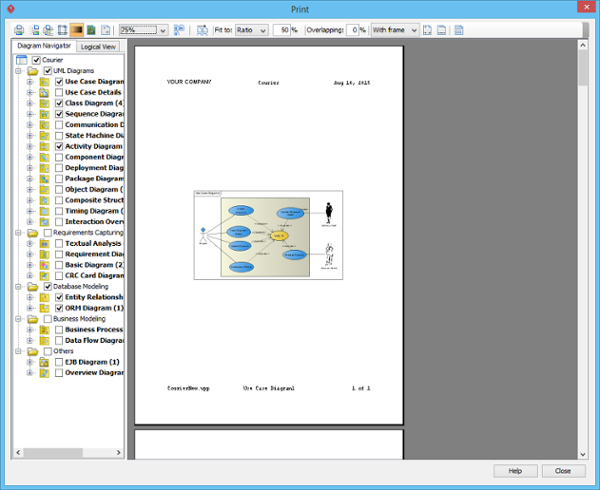 To select a layout of the preview, click the Paper Base Layout button or Diagram Base Layout button on the toolbar. A pop-up menu where you can choose the layout will appear. You can select the paper place style to change the order of the printout. To select the paper place style, click the Paper Place Style button on the toolbar. A pop-up menu where you can choose a paper place style will appear. Considering a large diagram is divided into many pages, choose From left to right will arrange the printout order from the pages on the left to the pages on the right, while choosing From top to bottom will arrange the print order from the pages on the top to the pages on the bottom. 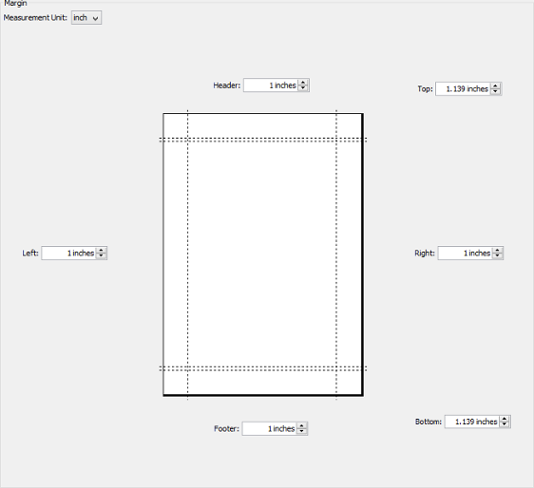 Fit to Ratio is used to resize the diagrams in the printout to a specific ratio. Click the Fit to drop-down menu and select Ratio. You can enter the ratio into the text field. After editing the ratio, the diagrams in the printout will be resized at once. 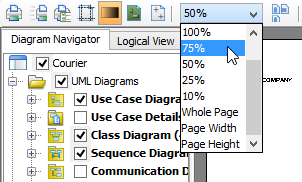 Fit to Pages is used to split the diagram to a desired number of pages when printing. Click the Fit to drop-down menu and select pages. Click the Multiple Page Mode button on the toolbar. The page selector will appear. Click the row-column combination to select it (note that you can click and drag on the page selector to extend the selection). 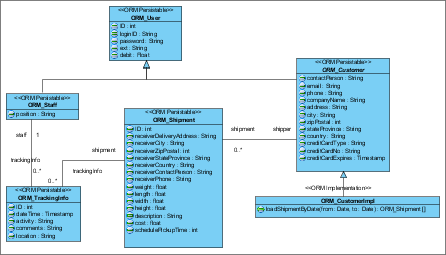 The diagram will be split into multiple pages by the rows and columns that you have selected. Overlapping is used when users want the diagrams to be overlapped at the boundaries between pages. This is particularly useful when you have a large diagram that span multiple pages and you want to stick the pages of the printout together; the overlapping area can then be used as a hint when sticking the pages. Input the overlapping percentage and press Enter in Overlapping text field. The printing area near the boundaries of the pages will be duplicated through the input value of overlapping percentage. Select With frame/ With border/No border option from the drop-down menu. Clip marks act as an indication of the boundary of a page. To show clip marks on the printout, click the Show Clip Marks on Page button . The boundaries of the pages will be surrounded by clip marks. To hide the clip marks, click the Hide Clip Marks on Page button again. To edit the header/ footer of the printout, click the Edit Header/Footer button on the toolbar. You will then switch to the edit header/footer pane. You can edit the header and the footer in the Header panel and the Footer panel respectively. 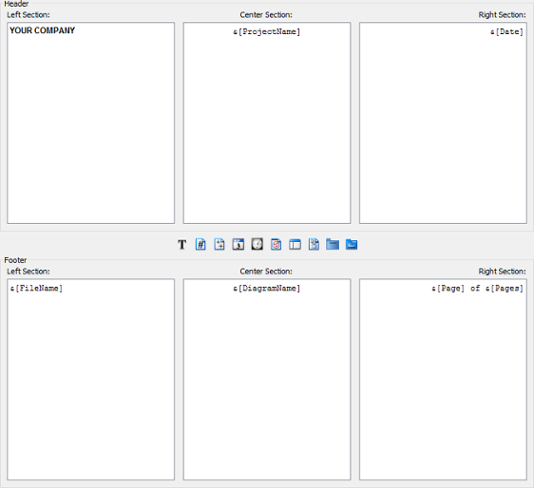 Each of the panel consists of the Left Section, Center Section and the Right Section, which represents the position that the content will be located in the header/footer. Select Font Select the font format. Note that you have to click the section you want its font to be formatted before you start setting the font format. Insert Page Number Insert the page number. Note that you have to click the section you want page number to be inserted into before you click it. Insert Number of Pages Insert the total number of pages. Note that you have to click the section you want the number of pages to be inserted into before you click it. Insert Date Insert the date that the printing starts. Note that you have to click the section you want the date to be inserted into before you click it. Insert Time Insert the time that the printing starts. Note that you have to click the section you want the time to be inserted into before you click it. Insert File Name Insert the file name of the Visual Paradigm project. Note that you have to click the section you want the file name to be inserted into before you click it. Insert Project Name Insert the name of the Visual Paradigm project. Note that you have to click the section you want the project name to be inserted into before you click it. Insert Diagram Name Insert the diagram name. Note that you have to click the section you want the diagram name to be inserted into before you click it. Insert Parent Package Insert the parent package. Note that you have to click the section you want the parent package to be inserted into before you click it. Insert Parent Hierarchy Insert the parent hierarchy. Note that you have to click the section you want the parent hierarchy to be inserted into before you click it. 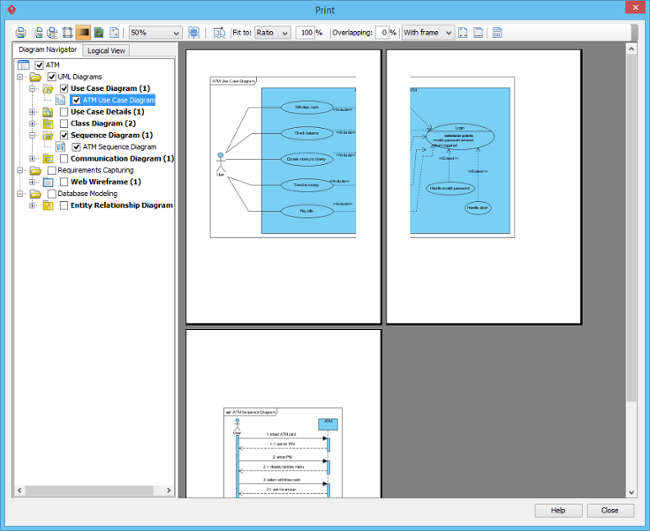 The Multiple Page Mode allows users to configure how the diagrams should be distributed in multiple pages. To switch to the Multiple Page Mode, click the Multiple Page Mode button on the toolbar. Click the icon behind Multiple Pages will pop the page selector out, where you can select the row-column combination for the printout. Alternatively, you can type in the Row and Column text field directly. Click the icon behind Page Style to change the printout order. 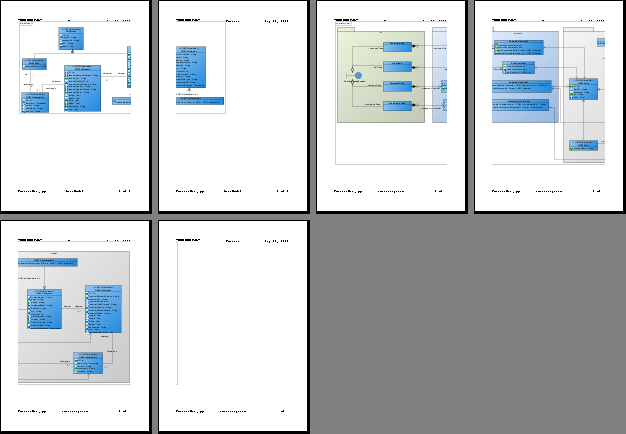 Considering a large diagram is divided into many pages, choosing From left to rightwill arrange the printout order from the pages on the left to the pages on the right, while choosing From top to bottom will arrange the print order from the pages on the top to the pages on the bottom. After you have finished configuring the multiple page settings, click the Close Multiple Page Mode button to close it.